• OK, I admit it. I may be projecting here. The Hawks 6-6 tie in the desert put me to sleep last night. Literally, not figuratively. Yes, I was exhausted. A short night of rest and a long Sunday will do that to anyone. But the Hawks were on TV and that usually is enough to keep me up well beyond my expected departure to Dreamland. But last night they didn’t. I saw Bobby Wagner leap a tall long snapper in a single bound and – legally, according to everything I read on Twitter – block a field goal attempt. I saw enough Jon Ryan punts to last a lifetime. And I saw a Russell Wilson who looked even more immobile than he did last week, which isn’t good for the Hawks’ future. But after that, I don’t remember a thing. It’s what I get, I guess, for watching the game in a reclined pose, pillows encasing my head. In my defense, I expected Cris Collinsworth’s inane commentary to grate enough to keep me awake. But it didn’t work. I didn’t see the Hawks tie the game on a late field goal. I didn’t see either of the successful overtime field goals and either miss. In a way I’m glad. I’m not sure there is enough Mylanta in the world to calm my stomach if forced to watch that type of unfulfilled tension. But what did it mean? Who did it help? The road team with two fewer losses, of course. If the Hawks didn’t widen their NFC West lead, at least they didn’t allow Arizona to close the gap. And the Cardinals need to start doing that. They had a golden opportunity. They blew it. You can say the same, to a lesser degree, for Seattle. The Hawks are not just trying to win the West but to position themselves for a long playoff run. Their main opponents are Minnesota – which lost yesterday – and, surprisingly, the Cowboys – who had a bye. That’s why Wilson’s mobility, or lack of same, is crucial. He’s a good quarterback from the pocket. He’s great when he can make folks miss and cause havoc. He can’t do the great stuff right now. And the lack of them handicaps the offense against decent to good defenses. When the Cardinals are healthy, they are better than decent or good. They are Seahawk-like. Which puts a huge onus on special teams. The Hawks won that battle last night until the final kick. And that brings up the second worrisome aspect of the tie. 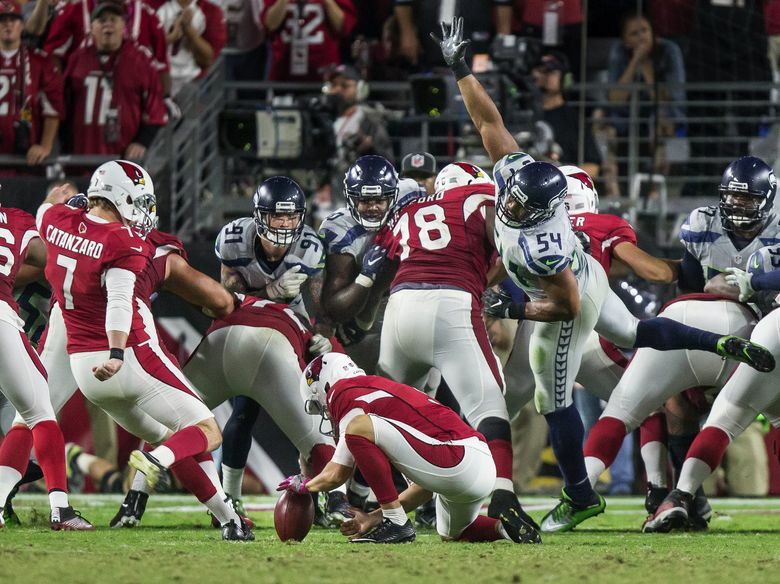 Steven – or Stephen – Hauschka has only been unsuccessful on field goals twice this season but that seems even more egregious when you consider both were shorter than 30 yards. And one, last night’s, meant the difference between winning and ... tying, which sounds so odd in the NFL. When you consider he has also failed on a couple of extra points, the label Mr. Automatic doesn’t apply anymore. The margin for error in the NFL is so tight, such little things might make the difference between playing in the Super Bowl or losing a playoff game on a freezing December day in Minnesota. And it’s even tighter for the Hawks these days due to Wilson’s injuries. Still, a tie is better than a loss. Even if it induced drowsiness. • Didn't get a release from the Pac-12 yesterday concerning Todd Graham's postgame barnyard language. Wonder if there will be something today. We'll see. • WSU: A quick question: San Antonio or San Diego? If that were your choice for a bowl destination, which would you choose? Myself, I love both but San Diego has a certain burger joint that would tip the scales for me. Wait, what? There are two In-n-Outs in San Antonio? OK, then the Alamo Bowl it is. ... Jacob Thorpe has a piece today on WSU’s continued success – five consecutive wins – but points out the fourth-quarter problems that are worrisome. Will they be a problem at Oregon State this week? Elsewhere in the Pac-12, the Huskies rose to fourth in the Associated Press poll – the Cougars just missed – and into most every prognosticator’s playoff scenario. But they will be tested this week at Utah, which has lost just once and are right on UW’s heels in the mythical Pac-12 power rankings. ... UCLA is in danger of not making a bowl game this season. And the schedule doesn’t get any easier considering a trip to Colorado is on tap this weekend. ... Arizona State hopes to get well at the expense of Oregon, another school who is in danger of not qualifying for a bowl. ... Arizona needs to get healthy to turn around a season that’s slipping away. Stanford needs better quarterback play. ... The week gets started with USC hosting California on Thursday night. ... If you are already looking forward to basketball season, we can offer you some information. • EWU: Around the Big Sky, Montana State can take solace in some words from Eastern's Beau Baldwin. ... The Cal Poly defense is getting better results. ... How in the heck did Southern Utah lose on Saturday? • Idaho: The soccer team clinched a share of the Big Sky title. • Whitworth: The men’s soccer team won yesterday. ... The Pirates hosted a golf tournament over the weekend. • Chiefs: Tri-City won in Vancouver on Sunday and the win marked a milestone. • Preps: Central Valley’s Hull twins, Lexie and Lacie, made a commitment to Stanford over the weekend. Greg Lee has the story. • Seahawks: The single most troubling aspect of the tie? Not sure I can point to one. Maybe you can. And the good stuff? That's a bit easier to identify. ... Jermaine Kearse's great catch was for naught. Again. • Sounders: The Sounders knew they had to win to assure themselves a playoff spot. They did, 2-1 over visiting Real Salt Lake. Now they get to host a single-elimination match this week. ... Portland, the MLS defending champion, saw its season end short of the playoffs. The Timbers lost 4-1 in Vancouver. ... Colorado did not lose a home match this season.